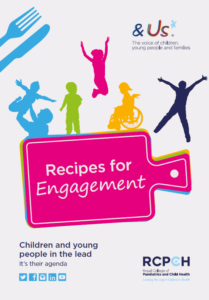 ‘Recipes for Engagement’ provides recipe-style, tried and tested activities for engaging children and young people and finding out what they think about healthcare services. The starters will work as ice breakers for groups, the mains will give you the views, ideas and wishes of your groups and the desserts will work as evaluation activities either for services or your group work sessions. Recipes for Engagement serves the additional purpose of making it as easy as possible for you to find out what children and young people using your services really think. This resource was created by The Royal College of Paediatrics and Child Health.